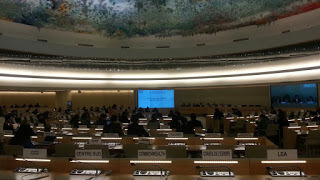 The Human Rights Council’s Universal Periodic Review (UPR) Working Group is holding its 26th session at the Palais des Nations from October 31 to November 11. The UPR is a state-driven process in which States present the steps they have taken to fulfill their human rights obligations and committments, assessing both positive developments and identfying challenges. 3) from other relevant stakeholders such as NGOs, academic/research institutes and national human rights institutions. The 26th session of the UPR Working Group is the final session to be held during its second cycle during which time all 193 UN Member States were reviewed for a second time. The final outcome documents of the 26th UPR session will be adopted by the plenary of the Human Rights Council at its 34th regular session that will take place in February-March 2017. The group of States to be reviewed during the 26th session are: Togo*, Syrian Arab Republic*, Venezuela (Bolivarian Republic of)*, Iceland, Zimbabwe, Lithuania, Uganda, Timor-Leste*, Haiti* and South Sudan*.